Where is that coffee table from/ Thank you. It's from Jonathan Adler. Unfortunately they do not sell it anymore. Rug - Where did you buy the rug? Love the sofa...where can I get it? Will you be so kind as to tell me where I can purchase this pillow? you can purchase the "hello darling" pillow at our retail store, www.hudsonboston.com, 617.292.0900. It is in stock and price is $150. This is the Denton Sofa by Bernhardt, which you can order from www.hudsonboston.com, and we did COM. It's by Ralph Lauren. Brad, sorry this color was added prior to my involvement. Where is that settee from? 12. Tartan. Take a note from school uniforms — those crisp white button-down shirts, pleated skirts and saddle shoes — when decorating a room.Does your house have a hint — or a lot — of schoolhouse style? We’d love to see it. Please share your best photo in the Comments. Table and frame. 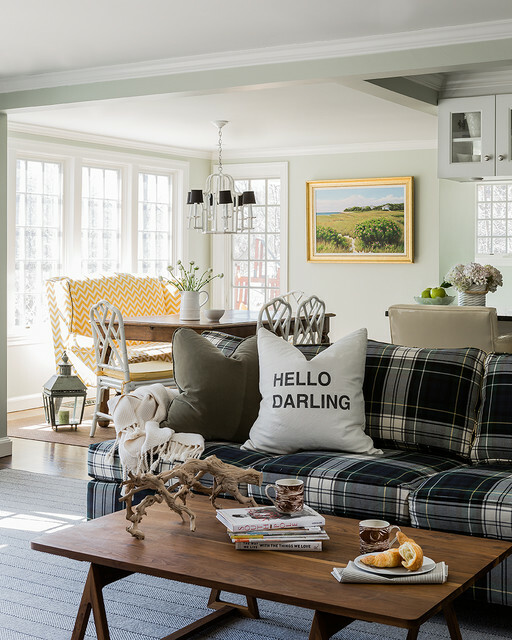 Plaid pillows.